Recently, I wanted to update my VMware Workstation version from 8.0.2 to version 8.0.4. In order to do this you must uninstall the older version of VMware workstation first. This is where the problems start to arise. There’s only one problem. I’m able to install and uninstall other programs with impunity. The ONLY one I can’t uninstall is VMware’s. More on this later. So I end up following all of the instructions in the VMware article to NO AVAIL. Essentially a big waste of time. I,then, went into regedit and manually performed a search for “VMware Workstation”. Then I deleted any keys that referenced “VMware Workstation”. (You do have a backup of your registry before you try this, right?) That is, when you find the value of VMware workstation, delete the entire key above it. It’s imperative that you delete ALL of these registry keys you find as there is something that the VMware installer is querying and “thinks” is wrong. I suspect something to do with ProgramData as well as the Uninstaller paths, but have no proof. I HAD to reboot (I tried running the 8.0.4 installer and it didn’t work). Once rebooted, I ran the Workstation 8.0.4 installer (again) which proceeded to properly uninstall the 8.0.2 version. Upon the 8.0.4 installation I received some weird installer errors, clicked OK through them, and ultimately, the new version is running properly. This is poppycock in my estimation. There is clearly something in their programming of the MSI package that is screwy. There should be some better error handling as well as descriptives as to what is being interrogated at failure. I parsed through all the VMware logs i could think of and received NO direction as to the issue. I ran Process Monitor and Process Explorer as well to see if there was anything sneaky going on. So if you find yourself in a bind, I hope these steps help you. They’ve worked on my workstation as well as another friend’s laptop. Please post here if you’ve had success or failure or have found the root cause of the issue. Hey man …. thanks for the fix. I got a prob with registry editor where i deleted all available vmware keys. 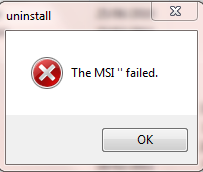 And yet when try to uninstall vmware workstation i get the MSI failed. I haven’t found any other article in the internet addressing this problem. Do a search for “how to uninstall vmware workstation manually”. You won’t be able to use the uninstaller if the reg keys are gone….the uninstaller will just error out. … one more thing: VMWare Tools also didn’t want to install; with the same error “MSI ” failed” (well, that was not visible with the automatic update routine, but when downloading, un-taring and executing manually, the error window quickly popped up). Searching (and – at your own risk – deleting) ‘tools-windows’ and ‘tools-linux’ respectively helped solve the problem. Thanks. Deleting every single registry key parent where the value contained vmware workstation resolved the install issue for me too. I agree with you about vmware passing the buck or blame to Microsoft is poppycock. The vmware support didn’t resolve it for me until I deleted everything in the registry with vmware workstation and parent keys. Then I could install after I rebooted. None of the above worked for me. The problem in my instance was the AV software Avast. I tried disabling the software which didn’t help. In the end I uninstalling the software, installed VMware Workstation which then installed fine, and then reinstalled Avast. This workaround worked for me. Thanks! Download the vmware_install_clearner utility from https://communities.vmware.com/docs/DOC-10303 and run it. Then run the VMWare setup.exe and click on remove. That worked for me.